OSWEGO – The Beacon Hotel in Oswego has added a prize package to be awarded at this year’s “Bundle of Bucks” raffle event on May 11 at the Oswego Elks Lodge. The “Bundle of Bucks” Charity Raffle features 15 cash prizes totaling up to $25,000 with a top prize of $10,000 to a lucky winner when all raffle tickets are sold! 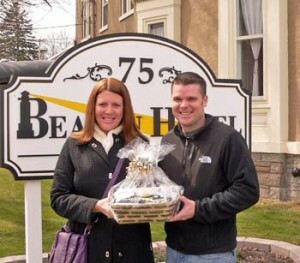 Pictured is event organizer Julie Chetney with Beacon Hotel owner Atom Avery. He is holding a Beacon Hotel gift package that will be awarded at the annual event. Proceeds from the raffle support the St. Luke–John Foster Burden Fund; benefiting those served by St. Luke and Bishop’s Commons on their Oswego healthcare campus, at Michaud Residential Health Services in Fulton, and throughout the community. Raffle tickets will be available until all one thousand tickets are sold – but hurry, tickets are going fast, and the drawing is now only weeks away! The entry fee for the raffle is $50 per ticket; only one thousand tickets will be sold. Every ticket is eligible for all cash prize drawings. That means you could win more than once! Each raffle ticket admits two adults to the “Bundle of Bucks” Raffle Drawing Party taking place from 1 – 4 p.m. the Elks Lodge in Oswego. The raffle drawing event features free food, beverages, live entertainment, games and prize drawings. You must be 18 years or older to participate in the raffle. You do not have to be present at the raffle drawing to win. For more information, call 342-3166. Ticket applications can be downloaded from the St. Luke website at www.stlukehs.com, and can purchase tickets directly at St. Luke Health Services or Bishop’s Commons in Oswego, or Michaud Residential Health Services in Fulton.